It’s time to get your outdoor spring-cleaning going, so you rake out the brush from around the shrubbery and wash the deck. Maybe you’ll give it a new coat of paint this year. Mostly what you’re thinking about while you get your extended outdoor living space ready for another season is that the conversation you had with your son the day he graduated from college. That conversation took place under the very awning you are hosing off, and the fabric looks just as good now as it did then. 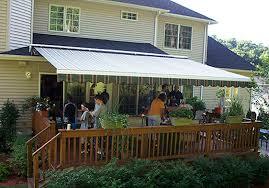 You’re glad you purchased a high quality Eclipse retractable awning. Your first summer company will be here next week and you want to get everything done so you have time to enjoy your visitors. You always clear the debris from the awning fabric with the garden hose, but sometimes a little gentle soap and a soft cloth are necessary. And you never forget to carefully check the frame for any signs of rust. You take good care of your Eclipse retractable awning and it takes care of you, shading your home and keeping you and your family safe from the dangers of the harmful UV rays of the sun. All these years later, the reliability of Eclipse lives on in your family. Before your son brought his first child home from the hospital, he purchased his first Eclipse retractable awning. Now your son is coming home with his wife and your first grandchild for a visit. No need to ask. You’ll be relaxing on the back deck together, holding your granddaughter under the shade of the old Eclipse awning. Eclipse Shading Systems products have been rated as the BEST RETRACTABLE AWNING BRAND for 3 years in a row by Retractable Awning Review.